Today, I have a meal that everyone will love. 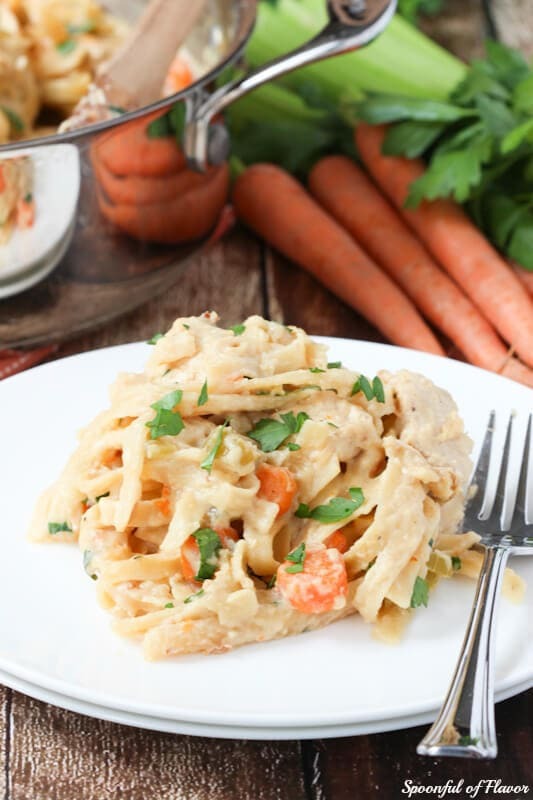 If you are still shoveling out from all the snow and hunkered down inside your house trying to get warm, this One Pot Creamy Chicken Pasta is warm, comforting and creamy. Oh, and did I mention, easy! 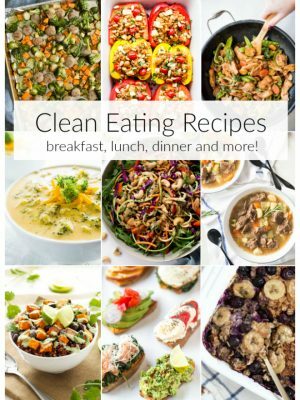 One pot meals are great because they are relatively quick and easy and you don’t have a million dishes to clean. After a long day, the last thing I want to do is spend an hour cooking a meal and then another half hour cleaning all of the dishes. On busy days, it is easier just to make a quick salad or dice a mango and avocado and eat them straight from the flesh for dinner. But sometimes, all I want is a warm, comforting home cooked meal. 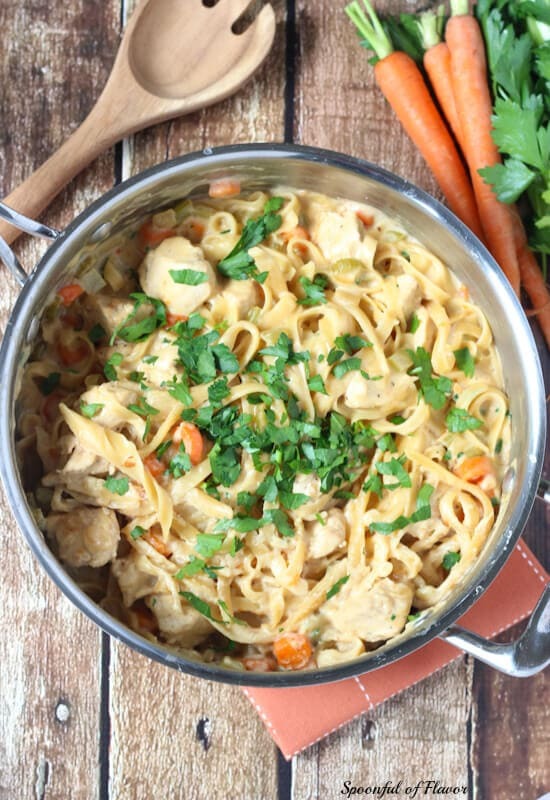 This one pot pasta dish is chicken pot pie in pasta form. I’ll admit, before I ever tried a one pot pasta meal, I was skeptical. How could all of these ingredients cook in one pot? Trust me, it works. Make sure pasta is just barely covered with liquid (add a little more if not). If the pasta seems like it still isn’t cooked, continue cooking for a few additional minutes. Make sure to stop by on Friday because I will be sharing a round-up of one-pot meals from some of my favorite bloggers. No more worries about what to plan for dinner. I’ve rounded up enough one pot meals to last you more than a month. 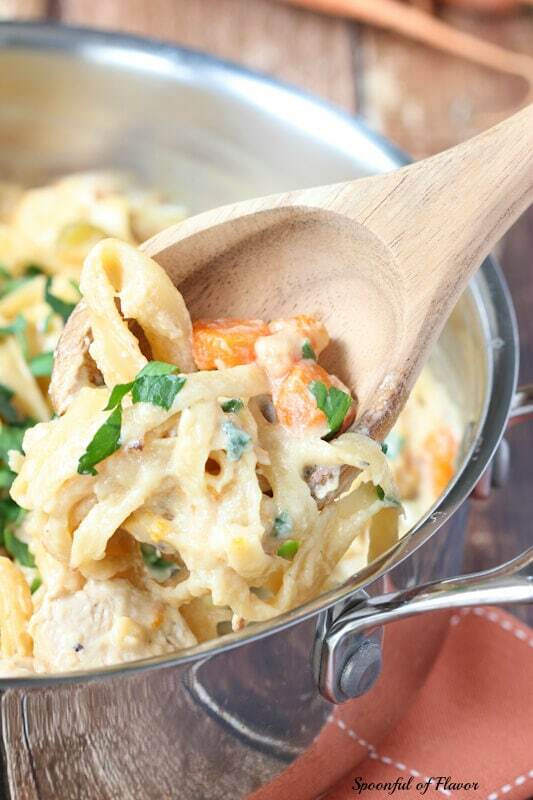 One Pot Creamy Chicken Pasta - chicken, vegetables, pasta and creamy sauce packed into one pot! 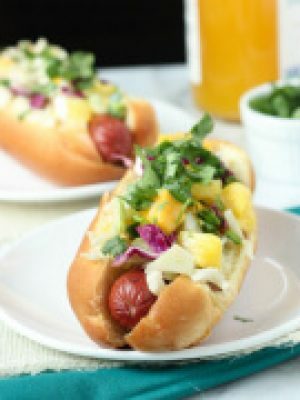 This is a meal that both kids and adults will love! Heat olive oil in a large pot or Dutch oven. Add vegetables and minced garlic. Sauté over medium heat until vegetables become tender, about 5 to 7 minutes. Add chicken and season with salt and pepper. Continue to sauté over medium heat until chicken is no longer pink. Add milk, broth and flour. Stir to combine and add pasta. Add a little more broth, if necessary, to cover pasta completely (about 1/2 cup). Stir to combine. Bring to a boil. Cover, reduce to low and cook for 20 to 25 minutes or until pasta is tender, stirring every five minutes to keep pasta from sticking together. Remove lid and cook another 5 minutes to allow sauce to thicken. Remove from heat, stir in cheese and top with freshly chopped parsley. This came out great, even after doubling. I had most of the ingredients on hand but used pipe rigate because that's all I had. Didn't have chicken broth so I omitted the salt and used hot water and bouillon. Added a bit of sherry, some thyme, and some hot pepper flakes, also some spinach, and a can of artichokes. This recipe is VERY forgiving. You can really use it as a base for anything you can imagine if you keep the basics in mind and KEEP STIRRING! also I garnished with feta crumbles. I'm stoked to try more one pot meals! Thanks for the recipe and inspiration! So I've made this recipe a few times and I really love it with the exception of one thing. The noodles always end up sticking together as well as to the bottom of the pan. Am I doing something wrong? Hi, Krystal! Do you stir to combine all of the ingredients and then stir again every 5 minutes? I make something similar but with rice instead of pasta, and I speed it up by using cream of celery and mushroom soups. Then bake until it is bubbly. My husband doesn't like pasta and barely stands rice, but he loves this. 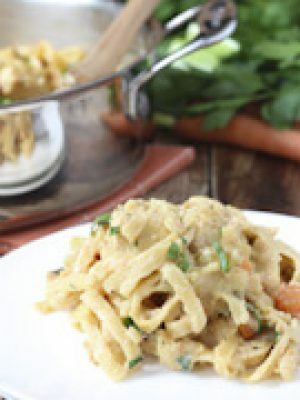 How do you add the pasta and stir without it breaking in pieces? Hi, Denise! I just stir it enough to combine the ingredients a little. You don't have to stir too hard or else you might break the pasta. This was delish! What's the calorie count in this dish? Love a one pot meal! Especially one as creamy as this one! what kind of milk should i use, is it evaporated, or regular milk? Looks great! 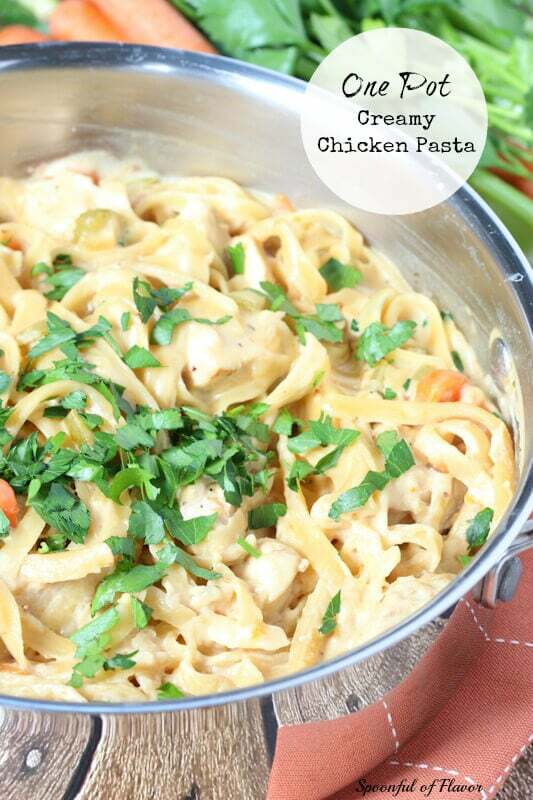 Love a good creamy pasta dish. Is the chicken cooked before hand? Hi, Brian! In step one of the recipe you cook the chicken until it is fully cooked and no longer pink. So, I made this tonight. I added mushrooms, spinach, a dash of worcestershire sauce, and a splash of white wine. It was super good. I will definitely be saving it. Thanks! Hi, Deanna! I am so glad to hear that you loved it! can I add mushrooms and white wine? Hi, Martha! I have never tried it myself, but you should be able to add mushrooms and white wine. Hi, I'm going to a potluck and wanting to make this dish. I was just wondering if the recipe could be doubled and still cooked in the same way and time? Any thoughts? Hi, Kara! I have never tried doubling this recipe so I can't guarantee results. If you do decide to double it, it would need to be cooked longer, until the noodles are al dente. It looks great, but the pasta won't get mushy cooking it that long? Hi, Sara! I'm not sure if you are asking a question or not. 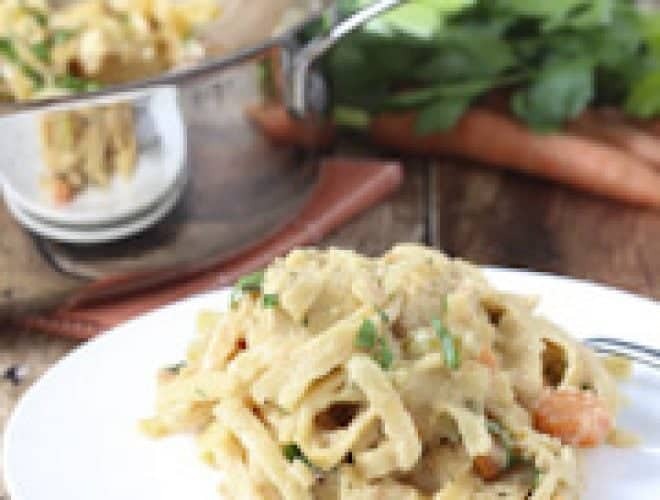 This is a one pot meal so the pasta is cooked with other ingredients. It cooks at a slower rate than if you were to cook it in boiling water. Ok, thanks! I didn't realize pasta cooks slower with other ingredients. I'll definitely try it tonight! This looks so good. I'm all about the one-pot meals. Less mess!And the ingredients look delicious together. Your pictures are really great, too, btw! Ashley, this is totally the kind of dinner I LOVE!!! I will be trying this very soon! Thanks for sharing at Saturday Night Fever Link Party - hope to see you again this weekend! Pinned to our group board! Aaah yes, this is comfort food. My boyfriend prefers creamy sauces and he'd absolutely love this. 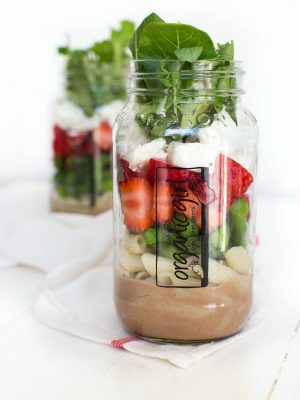 And it's all in one pot = I'm for sure making this. This looks every kind of wonderful! Thanks for linking up with What's Cookin' Wednesday! When do you add the noodles? When you add the milk, broth and flour? Oh boy does this ever look fabulous! And such beautiful pictures! 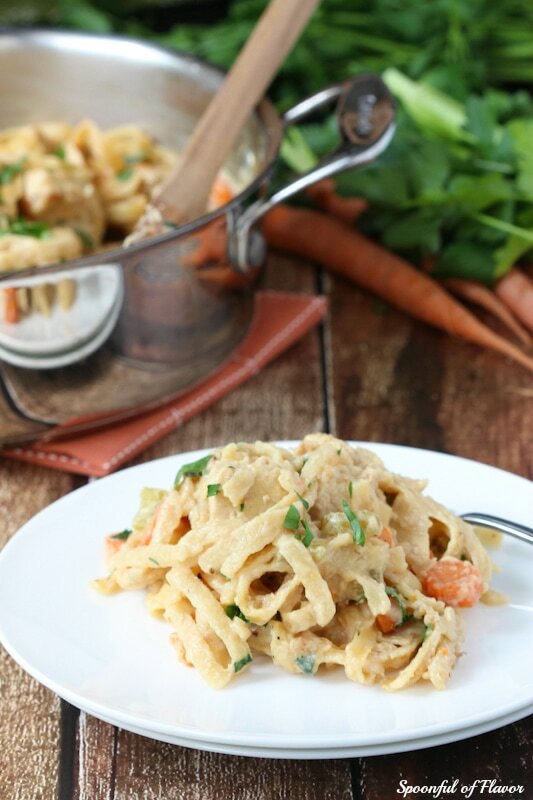 Okay, this pasta is totally going on my menu for this week. It looks soo creamy and delicious. My family will love it! pinned. Are the instructions correct cooking the pasta between 20 - 25 minutes plus an additional 5 to 7 minutes? Hi Pam, yes, that is correct. The additional 5 minutes allows the sauce to thicken uncovered. Although I don't think my directions were clear, so I updated them to make it clear. Thanks!